Nearly a year after being pulled off the Kentucky Derby trail, last season’s Sunland Derby (G3) winner Runaway Ghost will get his chance to ship East as trainer Todd Fincher targets a stakes race during Keeneland’s opening weekend. “It’s time to put him out there and let him be seen,” Fincher said. Fincher has circled the Grade 3, $250,000 Commonwealth Stakes, run at seven furlongs over the main track for older horses, on April 6 as Runaway Ghost’s next start. The Commonwealth Stakes is on the undercard of the Blue Grass Stakes (G2), a final major Kentucky Derby prep. Travel arrangements are still being worked out, but Fincher would prefer to ship in early. 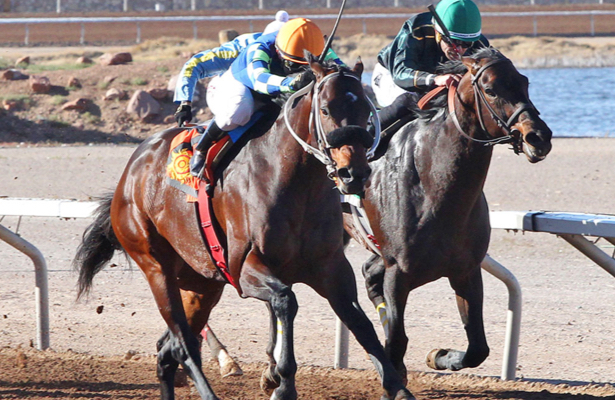 Runaway Ghost was training in New Mexico last spring when he exited an April workout with a cannon bone injury. He was rehabbed at Crystal Springs Farm in Tularosa, N.M., before he returned to Fincher’s care around Labor Day. The 4-year-old has been the heavy favorite in his two starts back and has not disappointed. He returned a winner in the six-furlong Ft. Bliss Stakes on Feb. 2, then stretched out to win at 1 1/16 miles in the Curribot Handicap on Feb. 24. Runaway Ghost, a homebred for Joe Peacock by Ghostzapper, began his career in California with Mike Machowsky before his starting his 3-year-old campaign with Fincher. The colt has won six of nine races, finished second twice, and has earned $653,510 on the track. Fincher will also aim for back-to-back Sunland Derby victories Sunday when he sends out Mine That Bird Derby winner Hustle Up. “It’s a different horse, it’s a different race – you know how that goes – different setups and hard to say what’s going to happen,” Fincher said. “But this horse is doing really good and he’s showed he likes the distance races better, the route races. We will see. Hustle Up’s biggest competition will be from Robert B. Lewis (G3) winner Mucho Gusto, who will ship in from Bob Baffert’s Southern California stable. A co-breeder of Hustle Up, Fincher has conditioned the New Mexico-bred gelding to eight wins in 10 starts, including five stakes victories. Hustle Up held off Wicked Indeed, who returns Sunday, by a length last out in the Mine That Bird Derby.